This is one-hour guided walking tour of this historic building offers and overview of its history, symbolic art, architecture and its works. This tour is open to 40 participants. A waitlist will be enabled once it is full. 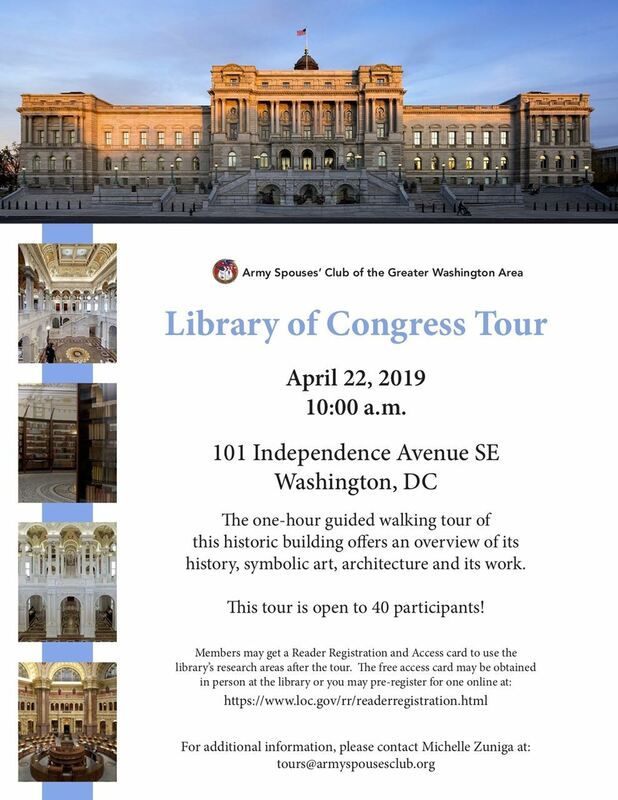 Reminder: Your one-hour guided walking tour of the Library of Congress is on Monday, April 22th at 10 a.m.. We will be meeting at the carriage entrance under the stairs promptly at 9:45 a.m.. We must clear security before the tour at 10 a.m.. so please plan your arrival time to be ready to walk in at 9:45 a.m..
For additional information, please contact Michelle Zuniga at tours@armyspousesclub.org. We look forward to seeing you tomorrow!